I’ve always hated hospitals and airports. I find them vast and cold, very very cold. I guess it is to do with all the swanky steel and the blinding white light. It is not a cozy place to be in. And I would attribute this inherent dislike to my absolutely Indian sense of aesthetics. Before I am banished off of as someone who loves the hideously carved and highly varnished ‘Indian’ furniture, hear me out. I love the straight lines of FabIndia’s furniture. But give me the same thing in steel and leather and I would run a mile the other way. I’ve always wondered why our architects and interior designers borrowed so much from the West. We have some wonderful materials, a million sources of inspiration and some gifted artisans, yet our recently built public and corporate spaces mirror those in the West. 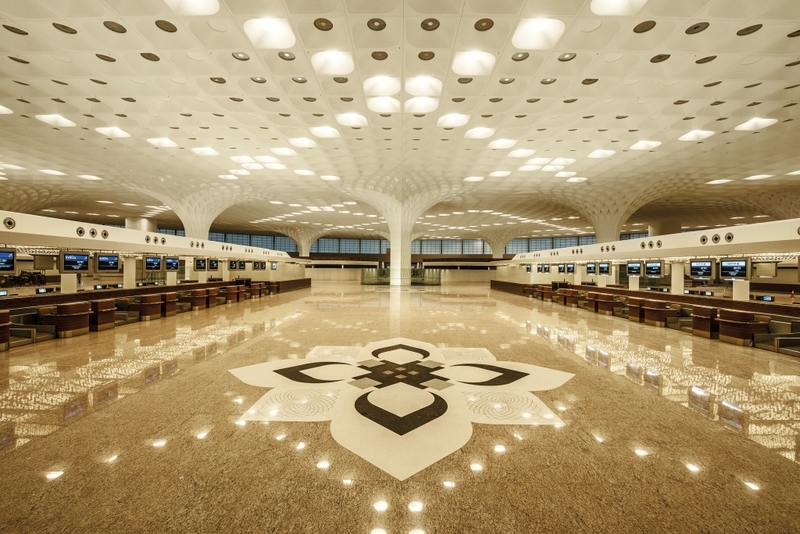 So when I saw pictures of the T2 terminal in Mumbai, I was elated. Designed by Rajeev Sethi, this is the reminder that we have arrived on the global scene. The way we flaunt our culture in one of the most visible points of the country is our way of telling the world, “Hey, look you are now in one of the most gorgeous countries of the world”. One of the largest art & craft galleries in the world with 7,000 artifacts and works by 1,500 artists, the 3 Km long art walk is a definite incentive to reach the airport much before time. For someone who works with crafts everyday, this is welcome news. ‘Contemporary’ architects and designers, please take note. We’d gladly help you install some of our country’s most beautiful hand-crafted products and solutions in your projects. Take a pick from 22 different craft clusters, experiment with modern ideas and shed those inhibitions once and for all. We have enough artisans waiting to take up this challenge. Let’s bring our crafts back home. Sharing some pictures of the T2 terminal. This is a special one, designed by a friend. As you can see, Madhubani is not all about Ram-Sita or Radha-Krishna. It is contemporary, celebrates our roots and cherishes a collective memory. Do watch this video on the process. Narrated by Amitabh Bachhan, this one is sure to touch that proud patriotic nerve somewhere. Rajeev Sethi and GVK, take a bow! I was born in the 80s, in Chennai. That would explain most of my childhood. It was education all the way. My life was wrapped around mathematics, sciences and my mother’s unflinching belief in the need to master Hindi (maybe she had an inkling about my future choice of husband!). I wasn’t particularly good at sports, but I made up by being the fastest at multiplication tables. It was a choice- sports or academics, never both. In all this, I missed out on few things during my childhood. Art was one such thing. I wasn’t the best at using the pastels back in school, but I loved the care-free indulgence that painting offered. There was no right answer and that thought was so much fun. So when I got my chance finally (forget that I am almost 30! ), the paints still hold that charm for me. I’ve gone berserk trying to mix colors, paint in that secret book (this is equivalent to bathroom singing) and having a ball of a time. Now I am glad I am able to offer that chance to many like me. A 5 day workshop on Warli painting. It will be conducted by Dilipbhai, a National Award winning painter. More about Warli very soon, but do remember that is an easy to learn painting. I am not training to be the next Hussain here. I am just going to paint my heart out, just indulge myself. If you are in Ahmedabad, come join me. Indulge! While such growth and potential have caused major scams and losses amounting to several crore rupees, the telecom sector has given rise to many heartening signs. The numbers above claim that about 70% of our population have access to mobile phones. This means so many people can connect easily with the rest of the world. Consider a situation 10 years ago for any Indian village. While the urban areas were getting better, the villages did not see any major growth. Our GDP rose rapidly, thanks to all the development in the service sector. In the middle of these shining statistics, a huge bulk of India was left behind. They had no access to power, clean drinking water, sanitation, primary education and no focus on women’s development. While successive governments were battling these basic issues, protecting local art and craft was not on the list. As with most businesses that flourish mainly because of demand, this one started dying a slow death. Craftsmen moved to alternate livelihoods. The most skilled painters were working as a daily wage labourers building huge skyscrapers for the urban audience that was growing by the day. Some of those who retained their craft started making low quality products in order to speed up their production.They used low quality raw materials. They were fighting a battle against mass produced inexpensive machine made products. Quality deteriorated and so did the demand. The second generation did not see a lucrative livelihood in this and they refused to learn the art. Today the scenario is a little different. A craftsman can set up a stall in one of the many exhibitions. He can pass on his mobile number to prospective customers. They customers can use that number to call him and place additional orders. He can stay in touch with designs with the help of MMS, market information, exhibitions via text messages and forums. His business is slowly coming back. At this point, he should be helped with some inputs on design and quality, better supply chain processes and a steady market for his products. He needs to be handheld for a while, till he is able to work on his own and even train the next generation. All this will take some time. From my side, I am glad for this. I am able to connect with artisans across the country. I use technology to help bridge the gap. I use technology to introduce them to urban centric products and aesthetics. I am helping them earn a livelihood with what they know best. I hope the next generation too will see this potential and take up the craft. And my sincere thanks to the telecom industry for this. I’ve been blogging for about a year now. I blog about my passions- the crafts that I work with, my travels, some projects that I do for clients and all the little things that I do in my home. So this blog has evolved as something bigger than just my work. 2011 has shaped me more than any of other years and I am happy for that. I start 2012 on a wiser note and I wish to share this as well. We all believe in a cause (sometimes many) and should stand up to that, no matter what. In this section, I will write about those things, the ones that matter to me and the people around me. I’ve been on Facebook for so long that I don’t remember a life without it. If there are a handful who know about what I do, I owe it to Facebook. Social media has changed the way we live, love and stay in touch. My mom leaves me messages on Facebook. She thinks it reaches me faster than the telephone! While spending those countless hours on Facebook, I started looking at it from a different point of view. My current profile picture (the one with my husband) has more than 30 likes and 20 odd people talking about it in the comments section. This is unlike my previous profile picture where I am holding an handcrafted, beautiful product in my hand. That picture has just 1 like and 1 person talking about it. Worse still, the products on my ‘page’ get about 2-3 likes. It takes me a good couple of hours to create the setting, compose the pictures, take multiple shots and edit them before they finally go on Facebook. Compare all this with 37,866,245 views on Kolaveri Di (when I last checked it), the hundreds of gushes over Aishwarya Rai’s baby and the patriotism that we shower on Indian Cricket. So why did I look up or rather wonder about all this? Because my livelihood depends on it. Social Media helps small companies like mine achieve some kind of awareness at a relatively low cost. I work with dying crafts, less priveleged craftspeople and their handicrafts (mostly of deteriorating quality). I work at understanding their work, using my skills and my experience in improving the quality of their work and help them create products that may be relevant to the audience. All this is hard work. It may seem interesting that I travel so much, get to meet those cool craftsmen, work on those bright colors and drink chai at the highway dhaba (while some others are slogging it off in air-conditioned offices, tired of flying so much and eating all that junk food). Trust me, it is not cool to travel 30 hours in a train (even second AC coaches have rats running around), eat random meals, haggle with the hotel owners to save those of couple of hundred rupees in an attempt to reduce costs, take local transport, talk to the craftsmen in sign language (India speaks several hundred languages and I speak just 3 of them) and convince them to work for me. I cannot promise regular work. I cannot be sure that my products will be ‘liked’, will be ‘shared’ and finally will be bought. In my naive days, I thought the tepid response was because people didn’t understand what they were buying. So I planned a day long trip to a craft village near Bangalore. Needless to guess, not one signed up. On a weekend, people had art galleries to visit, friends to meet, clothes to buy, movies to watch. So I ended up cancelling the non-event. It is not difficult to explain this to the craftsmen. They have been through it all these years and they know it all. I am one of the few who chose this path in life. I am definitely happy doing what I do, but I will not be able to sustain this if there is no demand. A business is a business afterall. Unlike the craftsmen, I have a couple of good academic degress and I can go back to the corporate world. I have an alternate livelihood. Hope that never happens, cos I will miss the ‘chai at the highway dhaba’!